“Peculiar travel suggestions are dancing lessons from God,” says Bokonon, the founder of the fictional religion that forms the basis of Kurt Vonnegut’s Cat’s Cradle. That belief system, Bokononism, consists largely of such mantras–harmless lies meant to improve one’s life if accepted and followed. Unfortunately for us, few of the people who create our transportation systems and guide our travel behavior have internalized that quirky advice. Two possible paths in Cambridge, Massachusetts. Source: Google Maps. Transportation planning requires a grasp of where people go and how they get there. The more sophisticated that understanding, the more effectively transportation can take people where they want to go. Planners gained the ability to model collective travel behavior once they had data revealing where people were going. Traffic counts, surveys, and transit station entrances (measured by the turnstiles) have been some of the most common sources of that information. The data that enable transportation modeling, thus informing major transportation planning decisions, have most often consisted of just an origin and destination, with little information about the path between the two. By necessity, models had to ignore instances of the “peculiar” and assume that everyone moved rationally. The shortest path from A to B became the route that everyone followed, in modelers’ eyes (with shortest evolving to mean fastest, least expensive, or a combination of these). There are plenty of reasons not to take the shortest path, of course, from safety to scenery to simply not knowing which route is actually most direct. British prog-rockers Supertramp even told us to take the long way home, but if anyone actually did, the models pretended otherwise. Models, of course, only describe our behavior; they don’t directly influence how we travel. As models have improved, strange incentives have emerged as unlikely “dancing lessons from God,” seemingly meant to confound the assumptions just described. Airlines’ frequent flyer programs, for example, have proved so compelling to some travelers that they fly with the primary goal of banking miles and the secondary goal of actually going somewhere. 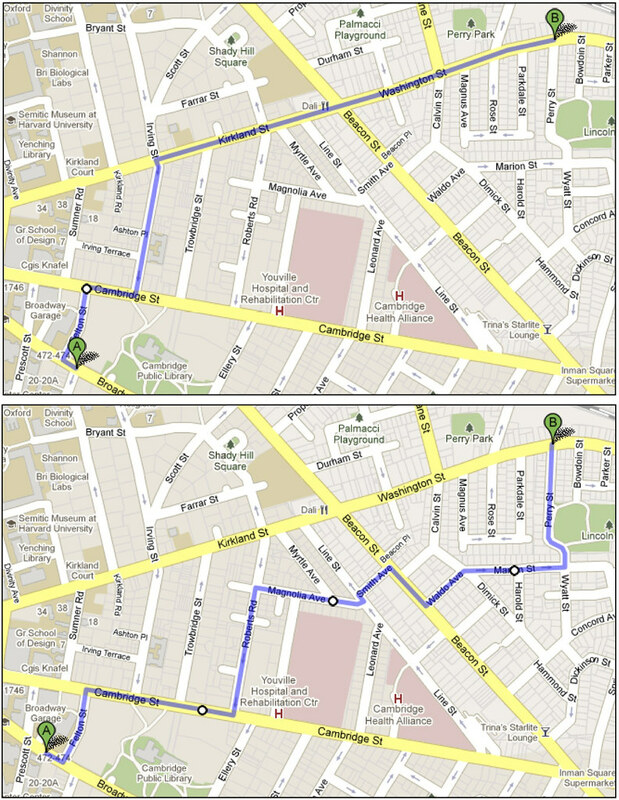 These “mileage runs” are the opposite of shortest paths: the more indirect the itinerary, the better. By frequent flyer logic, a trip between New York and Seattle (2,400 miles) is better if it passes through Miami (3,800 miles). Fortunately, airlines don’t assume the shortest path in their own models. Today, we can know more than ever about the actual paths people follow thanks to better data collection technology such as cell phone traces. Just as this information has become available, though, our actual travel behavior is adjusting to the modelers’ assumptions. Google Maps and similar applications calculate the shortest path for us, so irrational behavior is less and less probable unless deliberately pursued. Glancing at a map to find one’s way offers numerous possibilities, with some better than others, but the most efficient and popular sources of travel directions, provided by computers and smart phones, formalize the once-questionable shortest path assumption in the algorithms that make them tick, turning those assumptions into self-fulfilling prophecies. Peculiar travel suggestions may be dancing lessons from God, but perfectly rational travel suggestions are dancing lessons from Google, and maybe that’s what most of us prefer. Drew Austin recently finished his master’s degree in city planning at MIT, where he studied transportation and its role in urban development. He works for the Port Authority of New York & New Jersey. I hope Drew Austin gets hired as chief planner of Travel United or Your Way and My Way will be on the same highway.